The University of Wisconsin–Madison is pleased to announce that 20 students have been selected to receive grants through the Fulbright U.S. Student Program for the 2018–2019 academic year from the U.S. Department of State and the J. William Fulbright Foreign Scholarship Board. These UW–Madison students are among over 1,900 U.S. citizens who will study, conduct research, and teach abroad for the 2018–2019 academic year through the Fulbright U.S. Student Program. Recipients of Fulbright awards are selected on the basis of academic and professional achievement as well as record of service and leadership potential in their respective fields. Emma Strenski with grandfather Ed DeLaney. 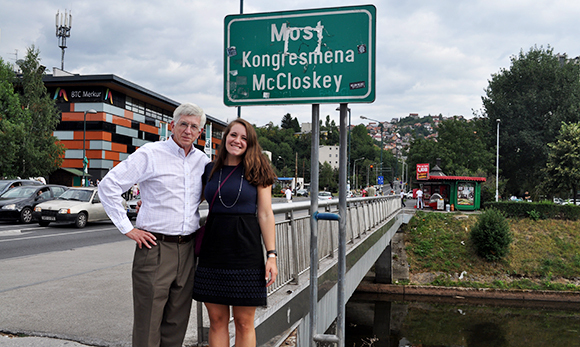 DeLaney accompanied Strenski when she did preliminary research in Sarajevo in August 2017. The Frank McLoskey Bridge is named for an attorney during the Arbitration. Students interested in applying for the program for the 2019–2020 academic year still have time. The campus deadline for the 2019–2020 Fulbright U.S. Student Program competition is Wednesday, September 12, 2018. The national (final) deadline is October 9, 2018. Students can learn more by attending a drop-in open house on May 8 or 10, or by making an appointment with Mark Lilleleht, UW-Madison’s Fulbright Program advisor, at awards@iris.wisc.edu or (608) 265-6070. The Fulbright U.S. Student Program is supported at the University of Wisconsin–Madison through the Awards Office of the Institute for Regional and International Studies (IRIS). IRIS is a unit of UW–Madison’s International Division. Learn more about the U.S. Student Fulbright Program at UW–Madison. Learn more about the Fulbright U.S. Student Program at UW–Madison. Since its inception in 1946, the Fulbright Program has provided more than 380,000 participants—chosen for their academic merit and leadership potential — with the opportunity to exchange ideas and contribute to finding solutions to shared international concerns. Over 1,900 U.S. students, artists, and early career professionals in more than 100 different fields of study are offered Fulbright Program grants to study, teach English, and conduct research annually in over 140 countries throughout the world. The primary source of funding for the Fulbright Program is an annual appropriation by the United States Congress to the U.S. Department of State’s Bureau of Educational and Cultural Affairs. Participating governments and host institutions, corporations, and foundations in foreign countries and in the United States also provide direct and indirect support.